Provides pre-emergent control in late fall and early spring on grassy and broadleaf weeds including Dallisgrass, Sandbur, Henbit and Spurge. 16 lbs. Covers up to 4,500 Sq. Ft.
A late season application helps prepare the lawn for survival in the winter and a quick green-up in the spring. Use prior to germination and emergence. 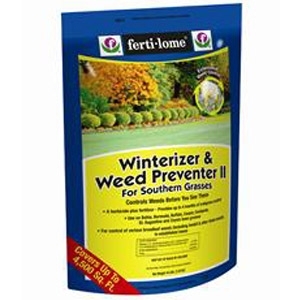 Provides up to 4 months of crabgrass control. Provides nutrients for beautiful healthy lawns.